Rørbye was greatly interested in exotic subjects, which he had rich opportunity to seek out during his travels around the world. It was typical of Rørbye to reproduce what he saw with an almost ethnographic precision. This unusual portrait of a Nubian belongs to this group of subjects, but also has something unusually intimate about it. Rørbye met him in Rome in 1839 and immediately wanted to paint him. He later repeated the painting twice, reflecting his obvious fascination with the man, who he has depicted with a warmly empathetic familiarity. 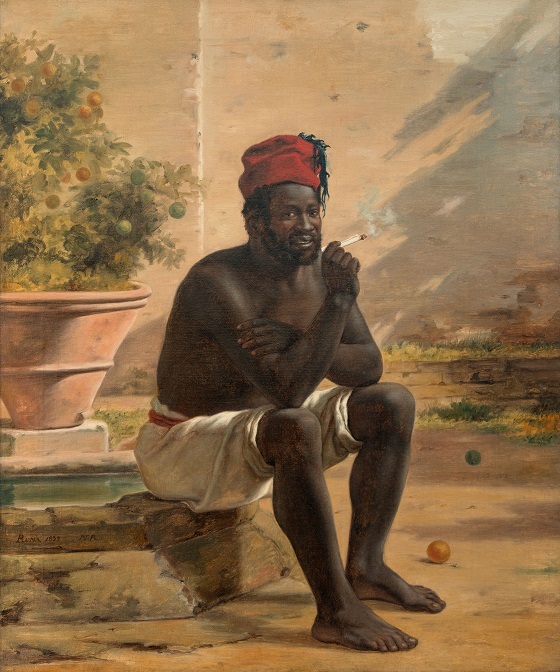 The fact that the man smokes a cigarette adds to the image’s exotic character, as white cigarettes were still uncommon at the time.